This is an evolution of last years dessert, the biggest change is I added pears; which gets the pectin and sugars from the pears making the mixture a bit softer and using less added sugar to get a similar consistency. I've also added another gum, Carboxy methyl cellulose (CMC) that makes a noticeable improvement to how it scoops and the texture. While it's got a scary name it's pretty common. I do all of this (including the water) by weight rather than volume. Pour the golden syrup into a pyrex jug. Weigh out the cornflour, agar agar, and CMC powders and place them on top of the golden syrup. Mix the golden syrup and powders with a fork, making sure that no powder is left on the walls of the jug. You should have a thick opaque yellow mixture. Pour onto the mixture the juice from the can of pears. Mix thoroughly. Finely slice and dice the pears; make sure you remove any pips, stringy bits or skin; add them to the mixture. Note if the pear pieces are too big they'll be hard and making scooping harder. Cover and microwave for 5 minutes in short bursts. BE CAREFUL this stuff boils madly. Top up with more boiling water to compensate for any lost during the cooking. Leave to cool until it's still hot enough to melt chocolate but not much more. Add the cocoa and glycerin and 75g of the chocolate. Stir throughly, the cocoa will try and clump, explain to it that it should not. Cool in the fridge for ~2 hours. I do this in the container for the ice cream maker. Chop the remaining 25g of chocolate finely (a bread knife works very well) and add it to the mix. Run in the ice cream maker (in my case for 1hr). The CMC really helps get better scoops; disappointingly the mixture still doesn't hold any air. The pears make a great addition, since pear & chocolate is a great combination but also because the pear juice is a natual sweetener and the pectin helps soften it. I should try removing the agar and cornflour now I've got the CMC, but I've not got around to it. The ice cream maker is necessary; I tried without it and you just get massive ice crystals even with the agar. I'm using pears in juice, not syrup, so it's very low calorie (I reckon this whole mix is about 100kC/100g). Something to try would be to try two cans of pears and remove more of the golden syrup and water, but it's difficult to get the amounts to fit nicely to the size my ice cream machine would take. My aim here to make a very very chocolatey dessert that was also pretty low calorie, so I could eat lots of it. I don't think it's right to describe it as either ice cream or sorbet, but it's closer to a sorbet. It works reasonably well, it's soft enough to get some curls with a scoop, although not really getting full scoops; it's biggest problem is I've failed to beat any air into it, I'd be interested in suggestions. Weigh out the cornflour and (optional) agar agar and put them in a microwavable container that can hold the entire mixture; I use a 1l pyrex jug. Pour in the boiled water, mix lightly. Place the mixture in the microwave, cover it with some kitchen paper and run it at full power for 1 minute; let it stop bubbling and then repeat in 1 minute steps for a total of 5 minutes. Take care because it bubbles furiously, so let it calm down between each step otherwise it'll go everywhere. If you've lost a lot of evaporation top it back up with hot water to 700ml. Let it cool down until it's comfortable to hold but still hot enough to melt chocolate (about 40mins). Add the golden syrup and glycerin, mix thoroughly. Add the cocoa powder, and mix thoroughly knocking any clumps out. 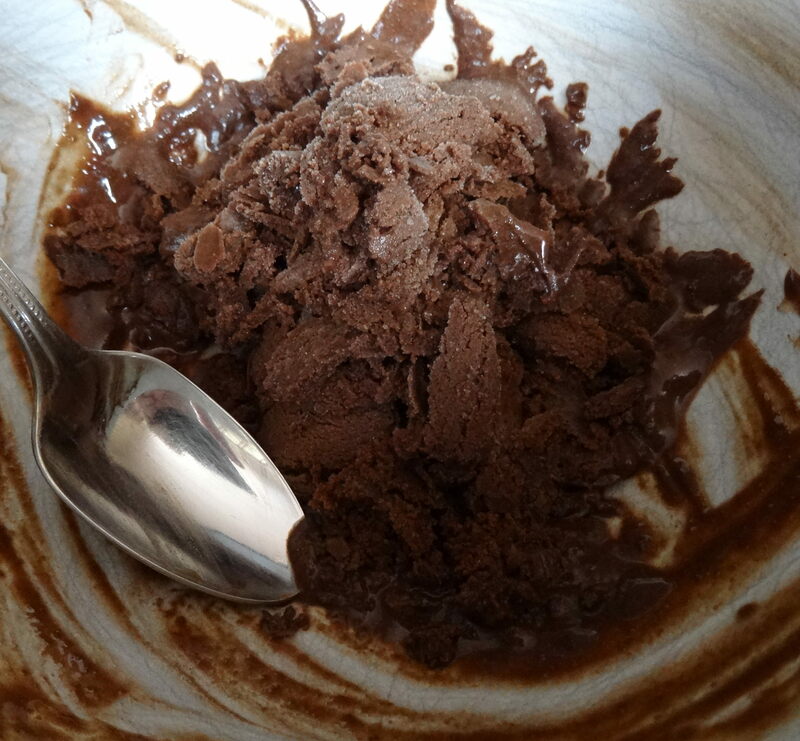 Break up the chocolate into smallish chunks, add to the mixture, stir thoroughly as it melts, make sure to catch any that's stuck to the side of the container and mix in. Let it cool down enough to put in the fridge. The details of what you need to do next depends if you have an ice cream maker (like I do) and it's exact instructions. 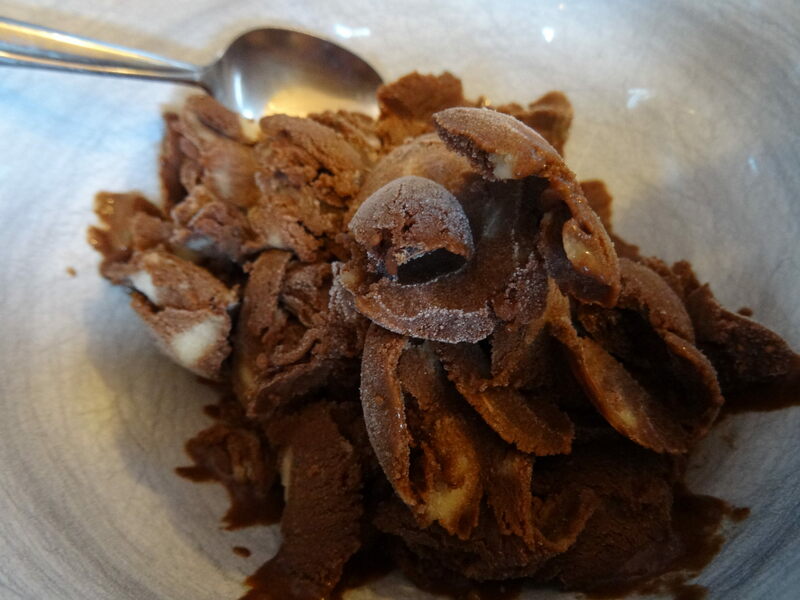 I pour it into the ice cream makers bowl and put that in the fridge, and let it chill for ~2 hours (which are the makers recommendation - I have a machine with builtin freezer). Remove from the fridge, if you've added agar you'll have something like a chocolate jelly, so break it up so that it will churn. Churn in the machine until mostly frozen. Freeze on low temperature in domestic freezer, or just eat there and then. I reckon it's about 125 kcal/100g - so you can eat loads of it!. You don't need to use the machine; just freeze it straight after taking it out of the fridge. However, I advise using the agar, otherwise I found I got really big crunchy ice crystals. Using golden syrup rather than standard sugar is supposed to lower the freezing temperature to make the result softer. Adding the glycerin (instead of more sugar) reduces the freezing temperature more and again makes it softer. Glycerin can be bought cheaply from pharmacies, or expensively from supermarket home baking shelves. Most manufacturers will tell you if it's artificial, vegetable or animal derived. Without the cornflour it melts to something very thin and liquidy. I add the agar to try and get some air into it, but haven't succeeded; I think it does improve the texture as it starts to melt. Getting it to hold air is where I'm failing; as it starts to churn I can see a little air being whipped in, but that disappears as it starts to solidify; perhaps the issue is one of when to stop the machine, or speed. I'm using the Cuisinart ICE100BCU with the 'ice cream' beater. Getting it softer would be good; I could swap more golden syrup out for glycerin; but I think the sweetness is about right as it is, and the real way to get it softer is to figure out how to get it to hold air.